White fillings used to restore the function of teeth that have dental decay, have been damaged by trauma and may be used as a cosmetic dentistry option for cosmetic bonding treatments. At Parkview Dental, we are pleased to offer mainly white dental fillings, here in our Brooks Dental Practice. 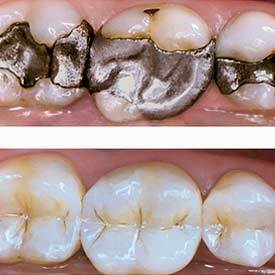 Traditional dental filling materials, which are best known as silver fillings, are not always aesthetically pleasing options for restoring the function of your teeth. White filling materials have been used for over 20 years, and many patients prefer white fillings over silver fillings for many reasons. After we prepare your tooth, we will place the white filling material in thin layers, to rebuild the structure of your tooth. A special light is used to completely set the white filling material making it very hard and durable against normal biting forces. Your dentist will shape and polish the white filling for a smooth finish, and so it bites together correctly against the opposing teeth. The most obvious benefit of white fillings is the aesthetic results that our dentists are able to achieve because he is able to blend different shades of white filling material to match the natural remaining tooth structure. We know that your smile is important to you and restoring damaged and decayed teeth with our Brooks White Fillings is one of the many dental health services that we offer at Parkview Dental.